An elegant yet rustic barn wood standing mirror. It is composed of barn and granary woods from the De Young ranch. All of our furnishings created from woods from the De Young ranch carry the family brand that was used for all life stock during the lifetime of the ranch. The owners have graciously allowed us to use this old branding iron to leave a mark on our work using materials from the ranch. The De Young ranch is located out of Kalispell, Montana. The barn and outbuildings very in ages from around 1890 onward. The ranch was an operating dairy until sometime in the 1980s. The homestead has lived it's lifetime and is now beginning a new life in our work. Much of this mirror is created from the old granary. A granary on a farm is an important place. 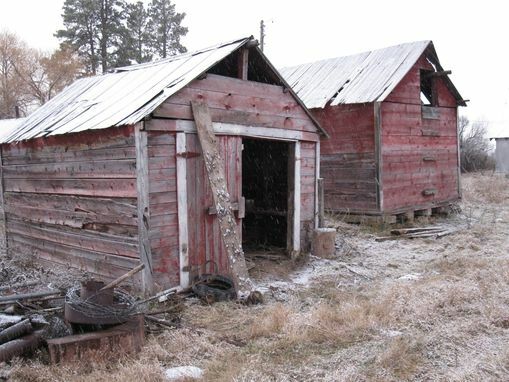 It houses all the grain used for feed for the animals, On the ranch that meant it fed the horses which once pulled equipment as well as the cattle and chickens. Now, a little history on the materials used to bring this Mirror together. Starting with the base. The large base is part of a beam that supported the old granary. It was reused on the granary after a first life as part of an old wooden bridge. So the age is hard to identify. The basic structural frame work composed from woods that worked hard for years as part of the old granary building. From the structural aspect we layered in red trim boards from the outside of the large dairy barn. The other trims on the mirror are cattle shaped and weather worn woods from the inside of the dairy barn. Metal trim is used to top this off. It comes from the old farm equipment parts and pieces found in the tool shop. As with all A Piece of History Montana's work we build high end furnishing which are put together with appropriate cabinet makers materials. You will not see any of this since we also believe that history based work such as this should not have any such thing showing. All screws are covered with nails that we hand pull from the building materials. We then cut the tops off to use to cover any new products used to assemble.